Eurogamer has had confirmation that Half-Life 3's inclusion in a list of games on the official Gamesom site was a mistake. Still, good job on the eagle-eyed journo that spotted it. Half-Life 3 will appear at Gamescom, according to a PDF list of videogames found on the show's website. T3 Online was the first to spot the inclusion of Half-Life 3 on the list, the game being the only one to be revealed by Valve at the show. The PDF clearly states Half-Life 3 but Gamescom's list does note that it takes 'no responsibility' for the accuracy of the information, admitting that it is gathered from forums and blogs. Still, a slightly odd stance from an official show. TechRadar spoke to Mike Sawh, the journalist that spotted the inclusion, who said about the find: "I was simply searching around for assets on the official Gamescom website in preparation for T3's coverage of the gaming expo, and spotted the list of announcements in a PDF, and there between Ubisoft and Warner Bros was a single listing for Half-Life 3. "If it's true, this could be without doubt the biggest announcement of Gamescom by some margin." Half-Life 3 has been a game that's five years in the making and is the most eagerly anticipated game of its generation. 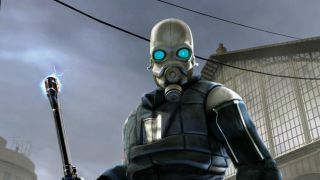 Orignally set to appear in 2007 as Half-Life 2: Episode Three, it has sinced failed to appear despite having such a massive fan base. Since then, its spin-off Portal has been developed into a hugely successful sequel which sparked more rumours that a Half-Life 3 release date was edging nearer. As T3 notes on its website, games magazine Game Informer is going late to press because of a big announcement set for Gamescom 2012 - could this be Half-Life 3? TechRadar, alongside the rest of the gaming world, is hoping so.